FAO took action at different levels and funded initiatives to fight aquatic weeds in Africa, following the requests for assistance from countries concerned. It (a) provided guidance and organized expert consultations to identify the best methods and state-of-the-art strategies; (b) provided up-to-date information to governments and sensitised them in regard to the need for and importance of using appropriate means and methods to control aquatic weeds; (c) conducted surveys to assess the levels of infestation and the nature of the problem under local conditions; (d) provided technical assistance for the training of personnel on weed identification and control; (e) introduced biological control agents and established units for mass rearing of biological control agents for the above-mentioned and other weeds; and (f) conducted control schemes in the field, in association with national institutions, scientists and specialists. FAO has emphasized the importance of adopting a regional approach in addressing the control of aquatic weeds, since a cooperative effort is essential for this kind of transnational pest control problem. The control of exotic aquatic weeds in Africa is very difficult, because of their aggressiveness, rapid growth and ease with which they spread. In this part of the world and in the absence of their natural enemies, these plants found ideal environmental conditions for their growth and at present it is impossible to eradicate them. However, these plants are not a nuisance in their homeland, where there is a balance with their natural enemies. 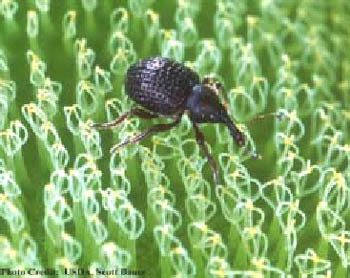 Biological control, through the introduction of the natural enemies of each plant from its area of origin, is the preferred method of control, since it is effective and environmentally friendly, has a relatively low implementation cost and is the only sustainable way to control these aquatic weeds. 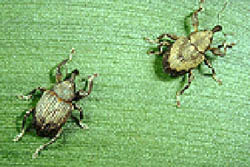 Insect herbivores have been introduced and used successfully in Africa, allowing the control of the pests in areas where this method was implemented. Also, the aquatic environment is very sensitive and freshwater bodies must be protected, since the use of chemicals may be a pollution hazard for rivers and fish and for the utilization of water for irrigation, drinking, or other uses. Nevertheless, the nature and the urgency of the problems posed by these weeds may require the use of a combination of the control methods available - an Integrated Pest Management - with the aim of obtaining a sound pest management. This means minimising the impact on the environment and achieving sustainable, long-term control. However, biological control should be the main component in this approach. Therefore the control of these aquatic weeds needs to be adapted to local conditions and specific problems and may require a combination of biological, physical (mechanical, or manual) and - under particular circumstances with heavy infestations and for short-term results - chemical means. Also, due attention has to be paid to the important aspect of preventing the development of infestations through avoiding the environmental conditions, such as water pollution, that favour weed growth and demographic explosions.